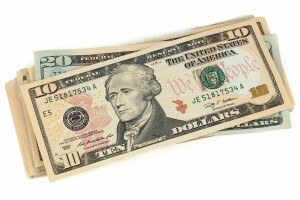 Maintaining a positive cash flow is critical to the daily operations of any small business. Many small businesses suffer from seasonal highs and lows in sales, thus leaving a void in their available cash assets. Many expenses still occur monthly, regardless of the volume of sales that generate revenue. The financial gap created by these low periods of sales is troubling for the business and its management. A possible solution to solving this problem is securing a line of credit. A line of credit can be thought of as an open loan from which the business can draw funds as needed, and repay, with interest, as cash comes in. A line of credit can be in the form of a credit card which many financial institutions offer. It may also be in the form of a more formal loan from a local lending institution. Both of these forms may be quite functional depending on the business’ needs. Credit lines that are secured, or collateral based, usually have lower interest rates than those from credit cards. A line of credit is a type of loan that doesn’t give you one giant injection of funds the way a traditional loan does. Like a credit card, you draw on the credit when you need to pay for something that is financially out of reach. Unlike most credit cards, the interest rates on lines of credit are generally low, and the limits tend to be high. Another difference from a traditional loan, a line of credit does not have a structured repayment schedule. In most cases, a monthly payment is required, typically the interest which has accrued on the outstanding balance for the month. The financial flexibility the line of credit offers makes it a very useful tool for business owners with good credit and assets in their business. 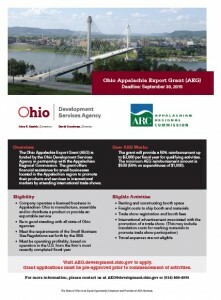 The Ohio Appalachia Export Grant (AEG) is now available to companies in Appalachia Ohio. AEG funds will reimburse companies a maximum of $3,000 (50% reimbursement on qualifying expenditures up to $6,000) for qualifying activities. The minimum reimbursement amount is $500 (50% of expenditures of $1,000). Grant applications must be pre-approved prior to the start of the activities. Grant dollars must be utilized by September 30, 2015. The purpose of this program is to assist businesses located in the Appalachian region to promote their products and services in international markets by attending international trade shows. Exporting enables companies to extend their product life cycles, take advantage of seasonality in products, and create global brand awareness. •	Must be operating profitably, based on operation in the U.S. from the firm’s most recently completed fiscal year. 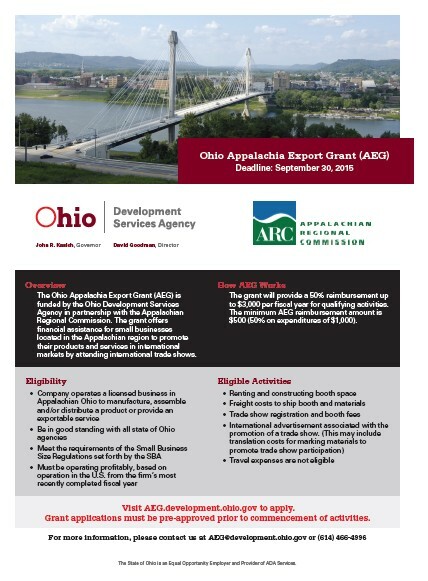 For more information about the AEG grant and how to apply, contact Melissa Carter, District 7 International Trade and Assistance Center Director, at 740-289-2071 Ext. 222 or email at carter.1094@osu.edu. 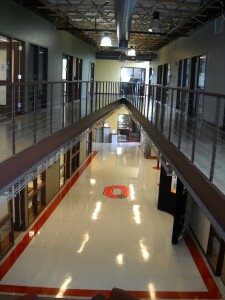 The OSU Endeavor Center manager and staff of the affiliated programs at the Ohio State University South Centers continually engage community organizations to maintain awareness of changing needs in the regional entrepreneurial ecosystem and develop solutions to combat negative impact to the economy while promoting the regions resources and talents. 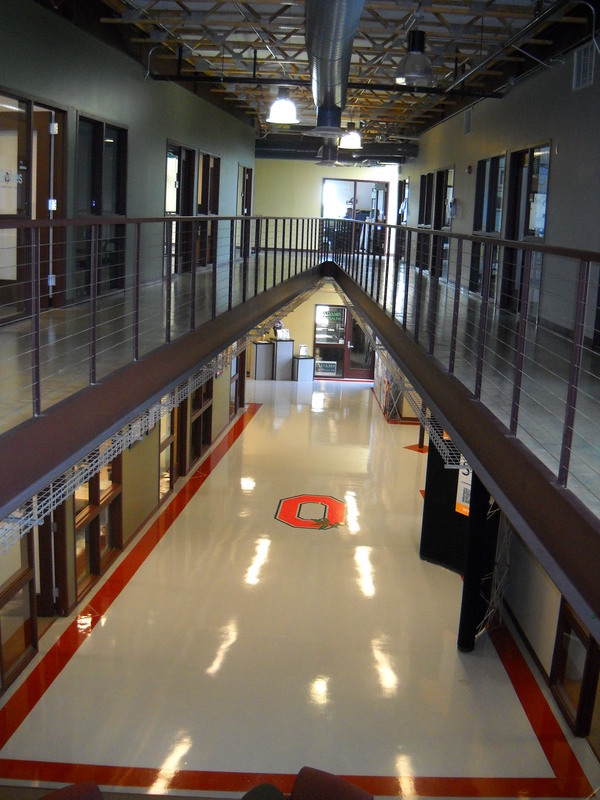 2014 was once again a successful year for the Ohio State University Endeavor Center, its programs and its partners. Open since 2005, the 27,000 square foot mixed used business incubator has come to be recognized as a community leader in economic development, business training, and technological excellence. •	created more than 1300, high-skill, high-wage jobs, adding more than 115 million dollars of direct economic activity to the local community. 5,300 attendees – business owners, prospective entrepreneurs and ambitious employees seeking to improve the profitability of their businesses so they can grow and provide additional employment opportunities for those in the community. In August, a partnership was formed with Community Action of Pike County to combat potential federal budget induced layoffs at the Portsmouth Gaseous Diffusion facility. Community Action Committee of Pike County received funding to create a temporary transition center to provide technical assistance for employees facing layoffs. In short time, the transition center was up and running in the Endeavor Center. Also in 2014, the OSU Endeavor Center was chosen as The Ohio State University’s nominee for the national C. Peter McGrath Community Outreach and Engagement Award. In October, the OSU South Center director and Endeavor Center manager attended the national outreach and engagement award in Edmonton, Alberta to learn more about the award process. The Endeavor Center staff is currently working with main campus to prepare the presentation for the 2015 national award process. 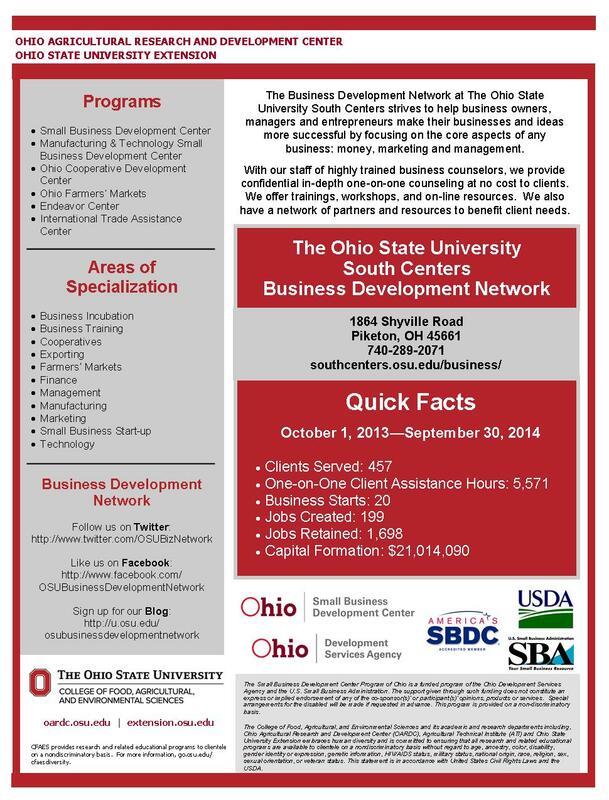 The Ohio State University South Centers Business Development Network provides services through many programs including the Small Business Development Center, the Manufacturing and Technology Small Business Development Center, the International Trade Assistance Center, the Ohio Cooperative Development Center, the Endeavor Center, and the Ohio Farmers’ Markets programs. Program services impact business success locally and state-wide. From October 1, 2013 through September 30, 2014, the business development network served 457 clients, provided 5,571 hours of professional one-on-one assistance, helped to start 20 new businesses, helped businesses to create 199 new jobs, helped businesses retain 1,698 employees, and assisted businesses to gain formation capital of $21,014,090. During that period of time, business professionals offered workshops, training sessions, and seminars to business owners, entrepreneurs, and others seeking to improve their technical business expertise—nearly 500 attended 39 events. If you have business questions, we can help! To request counseling, please log onto our Online Request for Counseling or contact Joy Bauman at 740-289-2071 Ext. 111 to schedule an appointment today.